Description: Intelligence and Development Scales for Pre-School Children allow for a multi-dimensional assessment of children aged 3-5. The test consists of 18 sub-tests to explore six different spheres of children's behavior including: cognitive skills (measured by the sub-tests Visual perception, Selective attention, Phonological memory, Visual-spatial memory, Spatial reasoning, Conceptual reasoning, and Auditory memory), psycho-motoric skills (measured by the sub-tests Motorics, Manipulation, Visual and auditory co-ordination), social and emotional competence (measured by the sub-test Social and emotional competence), mathematical skills (measured by the sub-test Logical and mathematical reasoning), language skills (measured by the sub-tests Active speech, Vocabulary, and Passive speech), and motivation (measured by the sub-test Gratification delay and by the scales Persistence and Achievement satisfaction). Reliability: Internal coherence for the Fluid Intelligence Scale estimated separately for each particular normalization groups took a value between 0,90 and 0.96. For the Crystallized Intelligence Scale the value was between 0,85 and 0,90, and for the General Intelligence Scale it was between 0,90 and 0,96. These are high values that allow for the IDS-P to be used in individual diagnosis. Reliability of results in spheres for each group does not fall below 0,80, whereas internal coherence of tests takes diverse values. The absolute stability of the results is satisfactory: it takes the highest value in the case of each intelligence scale (from 0,87 to 0,92), and slightly lower value in the case of tests and spheres (from 0,61 to 0,87). Validity: Confirmatory factor analysis confirmed that the original version and the Polish adaptation of IDS-P are strictly parallel. 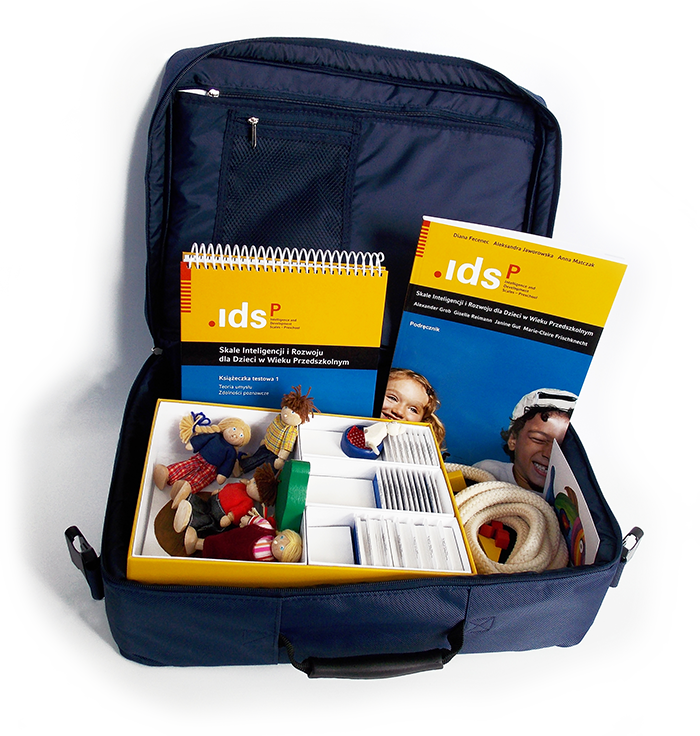 Correlations between IDS-P and such tests as Leiter International Performance Scale, Vocabulary Test for Children (TDS), or Rapid Naming Test: Version for Younger Children (TNS-M) prove its validity as a tool to assess various cognitive skills. High validity of the competence tests was proved, in turn, by the coherence of their results with teachers' and parents' assessements. Compared with the results in clinical groups (with Down syndrome, FASD, specific disorders of speech and language development) the results of children in general population were different as expected. It also turned out that in the case of children with speech and language disorders it is possible to define a profile of IDS-P results specific for each disorder. Norms: Results were normalized for tests (scale 1-19 with M=10 and SD=3), scales and spheres (IQ with M=100 and SD=15). Children aged 2;11(31) to 5;11(31): within the first half of the third year norms are developped for quarter intervals and from the second half of the third year – for biannual intervals. 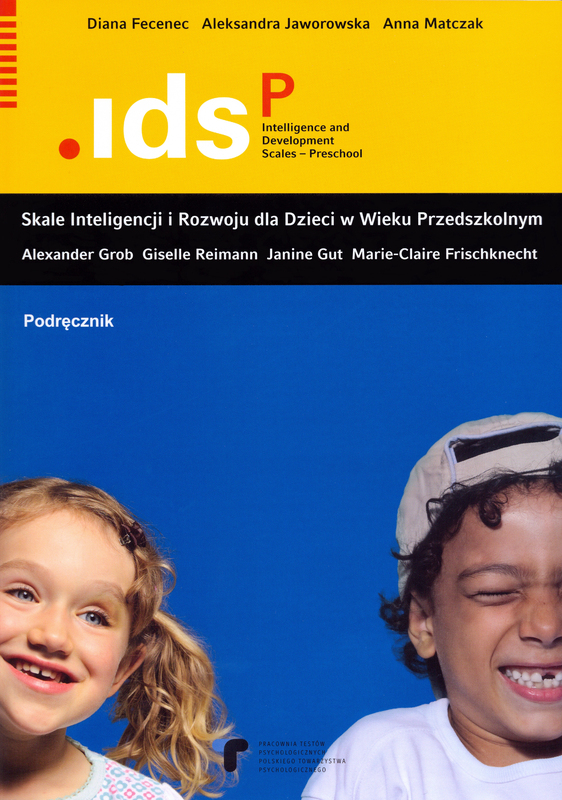 Application: Opportunities of analysis and interpretation given by IDS-P make it a pefect tool to be used for assessing intelligence level, defining strong and weak points of a child (in connection, for example, with education and re-education planning), and distinguishing children who are most gifted or have a high intellectual capability.